We saw both sides of Felix Hernandez against the Rangers. How much longer will we see him at all? 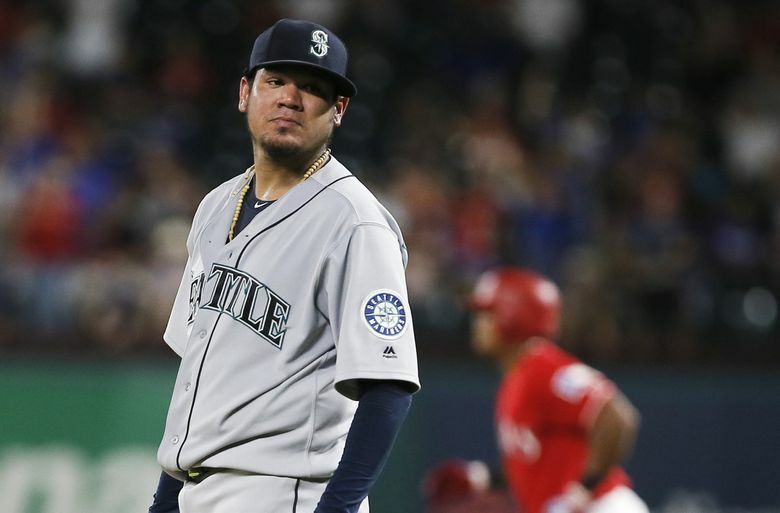 Even in a poor outing Tuesday night, Felix Hernandez showed flashes of his old self, striking out and trash talking Adrian Beltre. But 2018 Hernandez prevailed, and now the Mariners must make a decision on the 32-year-old former ace's future. For Mariners fans, it’s hard to say what was harder to watch: The King’s yearslong slide off his throne, its possible apex in Tuesday night’s loss to the Rangers or his somber reaction to it postgame. Felix Hernandez was shelled in the Texas heat, allowing the most runs in a single start of his career — 11 — and the most earned runs — seven — since August 2015, over six innings. “I’m frustrated, man, that’s all I can say,” he told reporters in Arlington after his start. But even in his current state, Hernandez still shows flashes of the fiery, dominant starter he once was. For the first two innings Tuesday, Felix was Felix. He sent down the first six Rangers in order, even making Adrian Beltre look silly. He induced a desperation swing out of Beltre on a curve for strike three and doubled over, pointing and laughing in good nature at his friend. It didn’t take Beltre’s eventual revenge to remind us this is 2018 and Hernandez is the owner of the second-worst ERA in baseball among qualified starters. Beltre’s sixth-inning solo shot was the K.O. on Hernandez’s 11-run outing. It could too have been the final blow on his illustrious Mariners career. It’s not one start that has put his rotation spot in jeopardy. For the first time since 2007, his status of opening-day starter was in question. The Maple Grove hasn’t yet supplanted the King’s Court, but “EH” cards have replaced the “K” cards. No longer is Felix Hernandez the man the Mariners turn to to stop a losing streak. For the past few seasons, the one-time power pitcher has been able to rely on one of the game’s best changeups and a variety of off-speed offerings. But at age 32, Hernandez may have to reinvent himself again. Beltre could have taunted right back after launching his home run. But maybe, as the final blow on a brutal night, he decided it wasn’t the right time to continue the antics. Someone, eventually, will have to make the difficult decision on Felix’s future in the rotation. With Erasmo Ramirez’s impeding return, is Scott Servais near pulling the plug on the one-time ace? This is the man who has endured Seattle’s suffering with it. The entire second half of Felix Hernandez’s life, 16 years, has been spent in this organization. A pudgy, bushy-haired 16-year-old who arrived in Everett from Venezuela, Hernandez came of age here. He signed multiple extensions with a team that never once allowed him the chance to pitch in the postseason. After the last one, a record-breaking, seven-year deal, a hoard of fans gathered to surprise him with a King’s Court for the press conference announcing it. Now, with Hernandez nearing the end of the road, Servais and general manager Jerry Dipoto are left in an unenviable position. The former face of the franchise’s future is in their hands, and all we can do, to use the manager’s own words, is see what happens.